IT’S been another depressing few days in the world of Liverpool FC. From the massive high of ruining Manchester City’s unbeaten run to the predictable defeat by the side currently sitting bottom of the league, it has all felt typically Liverpool in a way we’d all rather wasn’t. I’d like to say I remember a time when “typically Liverpool” meant winning the league regularly but, sadly, I’m not old enough, so beating the giants while struggling against the lesser lights of the league continues to be “typical” of my Liverpool supporting experience as an adult. Having lost a game to a goal conceded from a corner, it’s inevitable that a large portion of the analysis surrounding the game will focus on our defence again. But before we delve into the whys and wherefores of that goal, it’s worth taking a moment to consider that we have faced 51 corners since the Sevilla game without conceding a goal, spanning over 13 matches. Liverpool faced 51 corners between conceding an injury time equalizer at Sevilla and Swansea’s winner today without letting one in. two months ago. 13 and almost-a-half matches ago. but it’s still a huge problem the sky is falling. It doesn’t sound like such a big problem when put in that context, does it? Obviously, however, we’ve just spent £75million on a towering centre half so should never concede another goal from a set piece ever again. The problem being, it’s just not that simple. As Jamie Carragher said in the post-match analysis on Monday Night Football, one player cannot fix the ills of an entire defence. As the statistic above shows though, the ills of the defence might well have been, for the most part, greatly exaggerated, at least in relation to the recent record for defending corners. I’m a fan of watching everybody’s reaction to certain players and wondering how the same supporters would react to another player doing exactly the same things. I couldn’t help but think that when watching Virgil van Dijk against Swansea. While there’s no questioning the sumptuous pass to Mohamed Salah to create a goal-scoring opportunity, he also sliced a clearance to give the corner away that led to their goal, didn’t make proper contact with his clearing header from the same corner and hit a 30-yard volley into the stands when we were chasing the game late on. Obviously, the flip side of that is we haven’t yet watched van Dijk make multiple mistakes over a long period of time in a red shirt, so he quite rightly gets more leeway than his Croatian counterpart. His pass for Roberto Firmino’s chance in the last minute also gives us a glimpse into what he can offer in an attacking sense once he’s had more time to settle in. I’m not sure how everyone else reacts to price tags of footballers these days. The bubble in which I live is mainly made up of people who don’t really care how much a player costs as long as we get to see him in a red shirt, and I’m very much of that opinion. 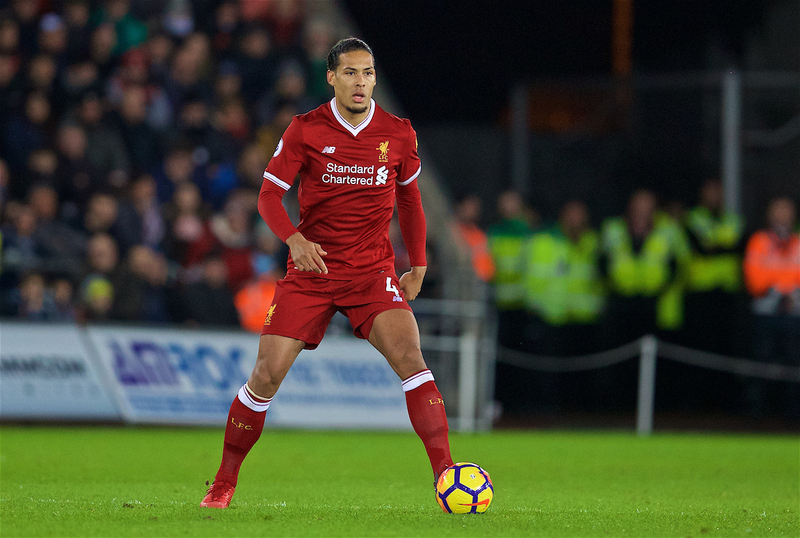 I also doubt that being the world’s most expensive defender weighs heavily on the mind of van Dijk who, to the outside world at least, portrays himself as calmness personified. 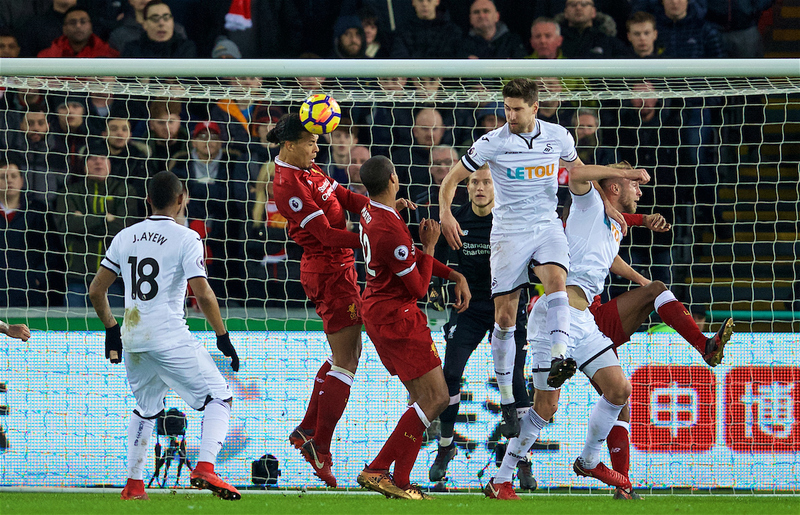 But, just possibly, there was an element in his Swansea performance of a man trying to impose himself on the game in the same way we saw Lovren try to do when he first came. I suppose scoring the winning goal against Everton in the Kop end on your debut might be good enough reason to want to be Superman in every match, so I’ll even let him off with his 30-yard piledriver and focus, instead, on the rest of his performance. What I think we have definitely already seen since his signing is a noticeable increase in the intensity of the other centre halves at the club. Despite the multiple other problems with Monday night’s game, I thought Joel Matip looked quicker and stronger than he has for a while. It might be coincidental that his performance has seemingly improved since van Dijk’s arrival, but as we saw with the Uruguayan superstar who used to scowl at his teammates at the other end of the pitch, just having a world-class player around the place can be enough to inspire others to increase their performance levels. 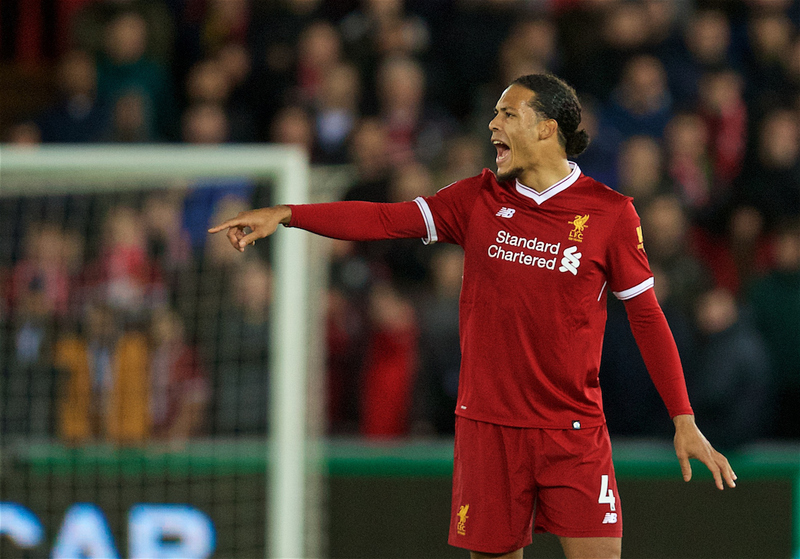 It was clear from the first minute at the Liberty Stadium that van Dijk is quite happy to command those around him, despite his arrival to the dressing room being so recent. The small taste of his qualities we’ve had so far can only bode well for the future, despite not being able to personally fix every defensive weakness we have. As for the goal itself, it was interesting to hear Slaven Bilic repeatedly refer to it being “unlucky” in his analysis. I think we’ve reached a stage with professional football in which it’s simply not acceptable to refer to good or bad luck any more. The statistics at our fingertips and the need for everyone to justify their existence on 24-hour sports coverage around the world means that it takes some balls to just say something was unlucky, as it’s bound to lead to criticism. For once, I actually do think there was an element of bad luck about Alfie Mawson’s goal. At first look I criticised Alex Oxlade-Chamberlain for not reacting to the second ball, but on reflection he was in a position to block the player closest to him until the ball ricocheted off that lad’s shins into his teammate’s path ready for him to swing a leg at it. It’s easy to criticise our players for Mawson being the first to react to that ball, but the momentum of his jump took him towards that area whereas the momentum of each of our boys challenging for the first ball took them away from the subsequent knockdown. That can all, at a stretch at least, be put down to bad luck. As I’ve said before, though, we can only bemoan bad luck if we’re willing to put goals at the other end down to good luck at times, and we very rarely hear any managers willing to do that. Whenever I find myself thinking something was unlucky, then, I consider what more could have been done to mitigate the impact of luck on the relevant scenario and, in this case, we didn’t need four players to challenge for the first ball. Had any one of those players opted to take a step back, allowing his colleagues to challenge for that first cross, he would have been spare and in prime position to clear the knockdown. Whether that should have been van Dijk is arguable, but I’d be more inclined to say that he should be the one challenging for everything in the air, with his teammates getting out of the way and covering any mistakes. Peter Schmeichel effectively said that’s how he operated when speaking on Sky Sports a few weeks ago. His defenders all knew that he would be coming for the ball no matter what, and their job was to cover him and buy him time to get back in goal if he missed the first challenge. Hopefully that’s something we’ll see develop over the coming weeks, which will allow us to get the best out of our new centre back while dealing with the second ball issue that has come up fairly frequently this season. As for the rest of his game, I mentioned on this week’s TAW Player Review show that I was surprised by how narrow the team set up because it removed one of the most powerful tools in van Dijk’s armoury — the 60-yard, cross-field pass to feet, which completely changes play and forces the opposition to move more than they would like. By Joe Gomez staying relatively deep and no one taking up a position on the right touchline, we forced van Dijk into playing short passes that any centre half could execute. Again, it’s important to bear in mind that the Swansea game was only his second appearance and it may take time for the coaching staff and players to make full use of all of his assets, although I’d have thought it was a fairly simple fix to tell young Joe to take up a position wide right to make the space for van Dijk to pick him out with some big switches. The good news is that, despite a few teething problems that were only to be expected, the Rolls Royce that we were all hoping for looks to be ready to drive The Reds forward in the second half of the season. We just need to make sure that we have the right mechanics on the pitch to make the most of his assets. Sounds right to me regarding VVD’s long passing. Also sounds like a very good argument for putting a cheeky bid in for Schmeichel! Well written article. Can’t disagree with any of your points. You touch on it slightly but I would also strongly emphasise his leadership qualities and what they will undoubtedly bring to the team. Think everyone agrees we have been at times utterly leaderless when games go against them but where the situation could be recovered with stronger leadership on the field. Good article, interesting analysis and insights. abit off topic but do you guys think bringing in André Schürrle would be a good idea? Just read that he is available and the baggies/magpies are trying to get him. On the narrowness of LFC’s formation, I wondered why TAA wasn’t started, or brought in as a sub as the game went on. Stretching the Swans defence by having full-backs run wide would have given us more options as they pull the ball back – it’s a staple that Pep uses when Citeh face packed defences. The same will happen this Saturday vs West Brom. I hope Klopp and his players adjust accordingly. Agree with all you say there Paul. In fact, I’d nearly go further to suggest that that’s the first time in years that I saw our defence dictate our game, because the weak midfield certainly didn’t. Matip was a completely different player driving up and passing with the confidence that others “had his back” to use a cliche. And he took that from VVD/Robbo who’re not afraid to risk the push up, pass and get involved too. Our narrowness up front were manna to Swansea who could squeeze our threats out again and again. I’d have preferred a 442 so Mane and Ox would be encouraged to play to the corner end lines before crossing or pulling in overlaps with the full backs. I think Gomez’s nightmare and reluctance to advance the sides stymied those possibilities too much and should’ve been hooked by half time for TAA. We’ve a new CB force and JG is not taking advantage of what that offers an attackingFull Back. The goal?.. it was unlucky- VVD is shoved by Can, makes a poor clearance, it bounces off one Swan and snatched at by another to cleanly travel through bodies into the net. It happens. But the late Ings backheel for example, to the rampant VVD who chips wonderfully to Bobby in the box gives me hope that there’s a new ‘desperation’ option we have attacking upfront as well as better cover and leadership at the back. The defence will never be sound until we replace the two dickheads we have pretending t be goalies.Looks like another wasted window in that respect.